Inspiriert von Schutzbrillen für Piloten, zeichnen sich die Rapha Pro Team Flyweight Glasses durch technische Funktion auf höchstem Niveau aus. Die von Carl Zeiss gefertigte Scheibe – als Standard in Grau/Bronze verspiegelt und mit UV400-Schutz ausgestattet; fünf andere Farbvarianten sind gesondert erhältlich – bietet optische Brillanz bei unterschiedlichsten Bedingungen. Die extrem leichte (25 g), aerodynamische Konstruktion sorgt für größtmöglichen Komfort auf langen Touren. Die Scheiben werden in Italien hergestellt und verfügen über eine kratzfeste Beschichtung, die beschlagfrei, schmutz- und wasserabstoßend sowie leicht zu reinigen ist. Die Bügel sind in mehreren Farbvarianten erhältlich (dazu kommt ein exklusives RCC-Modell); damit lässt sich die Brille optimal aufs Outfit abstimmen. Für den normalen Einsatz bei sonnigem, freundlichem Wetter. Rapha bietet für die Pro Team Flyweight Glasses sechs Scheibenfarben an, die jeweils an unterschiedliche Lichtverhältnisse angepasst sind. Das Etui der Brille bietet bis zu zwei zusätzlichen Scheiben Platz, sodass man stets für wechselnde Bedingungen gerüstet ist. Alle Scheiben bestehen aus leichtem, stoßfestem Polycarbonat mit beidseitiger öl- und wasserabstoßender Beschichtung und bieten 100-prozentigen UV-Schutz. Einen Bügel gut festhalten, mit der anderen Hand die Scheibe umfassen. Bügel und Scheibe gleichzeitig in entgegengesetzte Richtungen ziehen. Mit dem anderen Bügel ebenso verfahren. Die Scheibe mit Daumen und Zeigefinger festhalten. Mit der anderen Hand das Nasengummi zusammendrücken. Das Nasengummi nach unten von der Scheibe abziehen. Das Nasengummi auf die Ersatzscheibe aufschieben. Die Schritte 1 und 2 in umgekehrter Richtung ausführen und die Bügel wieder an der Scheibe befestigen. Bei Defekten oder Reparaturanfragen bitte den Rapha-Kundenservice kontaktieren. Rated 5 von 5 von Thom Green aus Lovely and light, Just bought them in the carbon frame. Super lightweight, but appear to be built with the level of durability required for regular use. The black lenses give a nice protection from bright sunlight. The silver mirror might be slightly better for this, but I have not tried them, and personally I prefer a none reflective aesthetic. I also purchased the brown lenses for darker light levels. I'd also like to have the yellow ones for rainy days... But I am not particular keen to spend the asking price just to have the extra option! I do believe the lenses themselves are overpriced, but hey! Rated 5 von 5 von njcc aus Very nice lightweight glasses Needed a new pair of glasses and went for these - glad I did as they are very nice, so light and comfortble. They are a similar style to my previous glasses so used to having a larger nosepiece - but don't see why this would be obtrusive if you were not used to them. Contrary to some of the negative comment I don't think these look cheap at all, certainly they are light and there is not much too them but what there is of high quality - the construction of the arms is really nice with the integrated logo and grips. The lenses are really clear and wraparound so block out as much light as possible - the straight top edge ensures seamless integration with any helmet. Rated 5 von 5 von rozinyak aus Low drag, great design - a few more options please I have bought a few pairs of glasses from different brands over the past few years, and I suppose that the reason for that is that althought I have loved them all, I have later always found out that something had been missing. They weren't quite right. In order to put this review into context, I have really loved the quality of those glasses, and certain features have especially worked for me, such as shading turning darker with the sunlight getting stronger, or the adjustability of the nosepiece, or the graduated shading of the glasses. 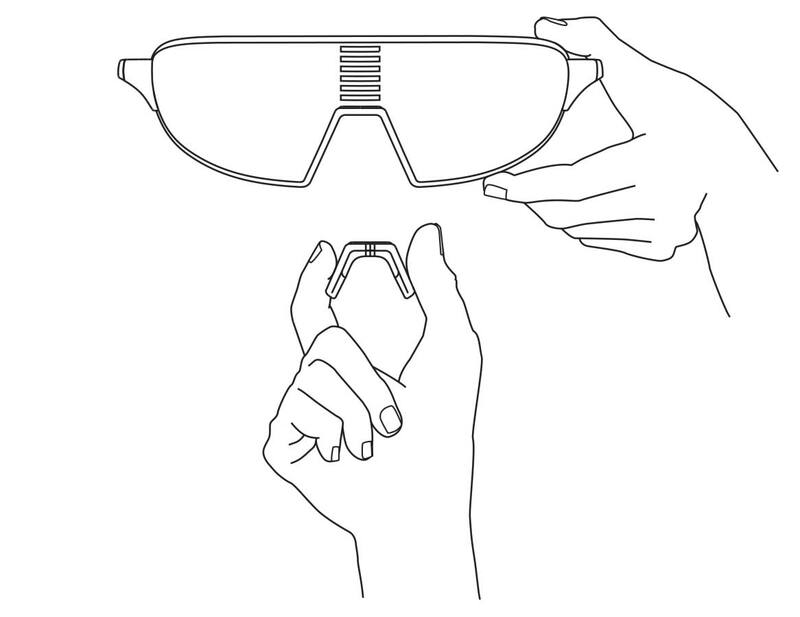 However, ever since the Rapha Pro Team Flyweight Glasses came out, I have been immensely interested in getting a pair. Being a long-time Rapha customer, I have never been disappointed in any product I have bought from Rapha and I knew these glasses were going to be terrific! I like the minimalistic design that is sporty but also as elegant as it can be in this category. Happily, the carbon edition had just come out when I was about to get my first pair so I decided to go for the extra strength. The packaging is excellent! High quality paper on the outside, metal box on the inside, and I like the fact that you can put additional replacement glasses in front of the one wearing the actual arms/frame inside the box. This is what you would call attention to details. The included pouch is much appreciated but I have been lovingly kept mine in the metal box so far :). I love the frameless design, I always have. I think it is a fantastic design, a great shape, which follows the lines of the nose and the helmet. I guess this was intentional during the development phase because it seems to aim for protecting as much of your eyes as well as the parts of your face around the eyes as possible. I should add that I think the size - for me anyway - is just right! I own both bigger and smaller glasses, but Rapha's seem to be perfect. At the end of the arms there is a snug piece of rubber to make sure they will hold tight. To me this is often a critical part of any glasses, since on a longer ride the pain behind the ears can be too distracting. Not with these! I don't know how, with the carbon and the rubber, but it works! I have never felt they were pushing too hard behind the ears. Another important aspect for me is the drag created by the air as I am cutting through it and how much it gets behind the glasses. I always wear contact lenses for riding, and it is not only extremly uncomfortable, but also dangerous if some bug whirls its way into my eye behind the glass, even at higher speed. Again, not with Rapha's! In fact, I have never owned glasses that had such unnoticeably low drag. My contacts won't make my eyes dry out in the headwind since the glasses block the air incredibly well, and whatever drag develops around the glasses, the air never hits my eyes. This is what gets my highest score! 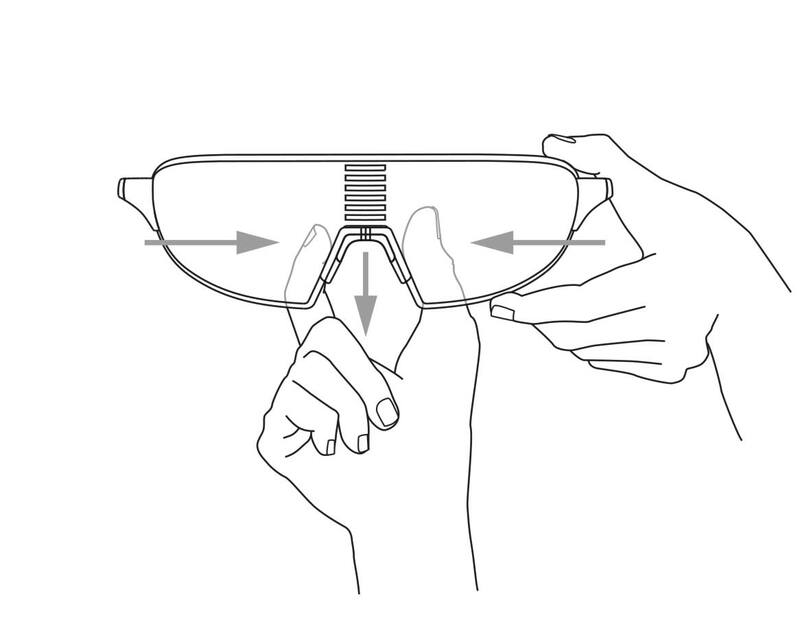 I have a couple of thoughts though that would be nice to see in future versions of the glasses. Unfortunately, one size does not always fit all. The arms sit perfectly wrapped around my head without a helmet on, but I cannot wear my preferred helmet with the Rapha glasses since the arms are slightly long, and they hit the adjustment plastic parts towards the back of the helmet. 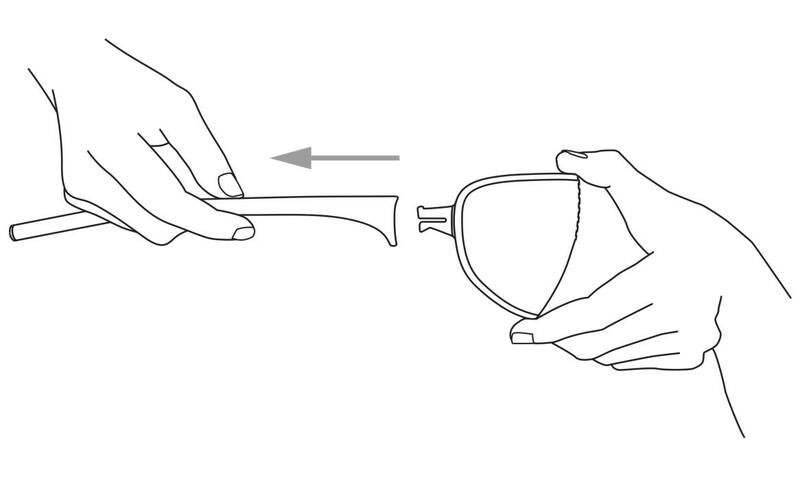 It is impossible to wear the glasses push correctly into place because then they will slide underneath the helmet and it will start hurting immediately. With another helmet it is much better but for me the arms are still too long. It would be nice to have a shorter length because with this length the nosepiece will just not sit on my nose and the glasses start slipping off. But again, this is only with one of my two helmets and I have had this problem with other glasses too. I wonder how the glasses could work with the Rapha helmet... Finally, rather than having a Lego-ish do it yourself replacement for both the glasses and the nosepiece, I'd very much appreciate a fixed but strong and adjustable nose piece that in my view has more flexibility, and perhaps a new glass option which could automatically adjust according to the strength of the sunlight instead of going for a ride with two glasses in case lighting conditions are too variable. All in all I think these glasses have a fantastic performance, I think the price is acceptable, and despite the few slightly annoying small details about the design I can honestly say that these glasses get the closest to MY idea of perfection. Even if they are not perfect. They will be though, if Rapha will consider the shorter arms, the "photophobic" glasses and the fixed, adjustable nosepiece. Rated 5 von 5 von CJ99 aus Goodbye Tears I have a rather small head and have a difficult time finding glasses that fit well. One ride with the Flyweights and I was beyond sold. I hit 20mph winds and where I'm usually wiping the tears that are uncontrollably running down my face away, there were magically none. Super lightweight, super comfortable, stays in place, and looks amazing. Rated 5 von 5 von JCote aus Best Glasses I've Ever Owned - And I Have A Lot I research A LOT before making a purchase on equipment I plan on using often and having for a while. When it came to finding the best pair of cycling glasses for my races and long distance rides, I wanted glasses that were frameless for better visual range (and reduce neck pain when in aero) and extremely light weight. I've never, ever been disappointed with my Rapha purchases and once again they nailed it! These bad boys are unbelievably light, stylish and effective. Love 'em. Rated 5 von 5 von Big W0rm aus Feels like nothing These glasses are as light as a feather. Once you have them on you may forget you have them on your face. Also, careful with the nose piece when swapping out lenses as I broke mine right out of the box (maybe I was too stoked). Contacted Customer Service and they sent a spare part asap! Rated 4 von 5 von DubaiSwiss cyclist aus Looks Great, Fits extremely well Was debating over these or the jawbreakers/radar ev's This fit well, look good, do the job, and have good vision. Still need to play around with the other nose piece it comes with, sometimes it fogs up inside. Rated 5 von 5 von see_a_d_why aus Bring on the sunshine! There's really nothing better than a sunny day during the grey PNW winter. Except maybe getting to wear these fabulous shades on a bike ride on a sunny day during the grey PNW winter. Even when it's grey out, just thinking about wearing these sassy glasses all summer long brightens my day. Hi,these are non prescription and we do not suggest to use two pair of glasses together. this price will get 2 lens in the box ? the mirror black and yellow? 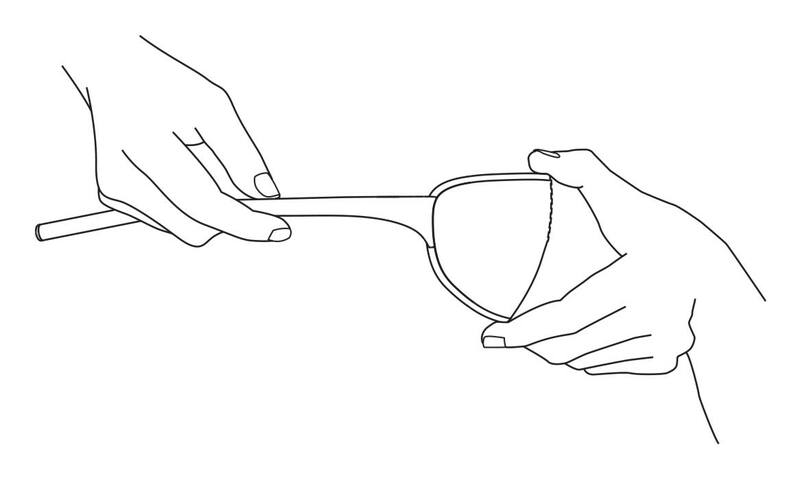 Hi, the link you gave us for your question is for one set of glasses only. Five other detachable lens colours available to purchase separately. I wear prescription lenses. &nbsp;Is there an adaptor or prescription lens? Hi, this are not suitable for prescription ready lenses. Do these glasses only come with one lense? or do they come with the default mirrored style for daytime and orange/clear lense for night time? or am I just wishing that? Hi, these glasses come with the lenses shown on the images. Extra lenses available to purchase separately. Are these lenses breakfree if comes crash? Previously nearly lost an eye while hitting head to pavement, therefore interested to know. Do you no longer provide an extra free lens with each purchase? The promotion you refer to has now finished. The default lens is indeed the Natural Grey/Bronze Mirror version. The image on the screen can appear subtlety different from the actual product and this is due to several factors including the screen resolution and the difference between the amount of pixels used to re-create the colour way on your screen. Which lens does the carbon version come with? The Framwe will come with a lens that is a Carl Zeiss detachable shield (one-piece) lens offering UV400 protection (100&ordm;). The lens also features Hydrophobic and Oleophobic coating on lens. Danke für deine Anfrage. wir werden dich benachrichtigen, sobald Pro Team Flyweight Glasses - Purple erhältlich ist.